Whether your decking is made from hard or soft wood, it still needs to be maintained periodically. A spring clean isn't just for inside the house; after a long winter your decking could probably do with a little attention. The long wet and wintery months can be quite hard on decking, leaving it mouldy and mildewed, a slip hazard once you start spending more time outside. Jet washing a deck will soon get the wood clean, but it will also cause wood fibres to raise as they expand with water, creating splinters as they dry. If you find that the surface of your decking is becoming rough and splintered, just ask Diamond Garden Care to sand and seal the wood, apply a wood stain or treat with wood preserver. 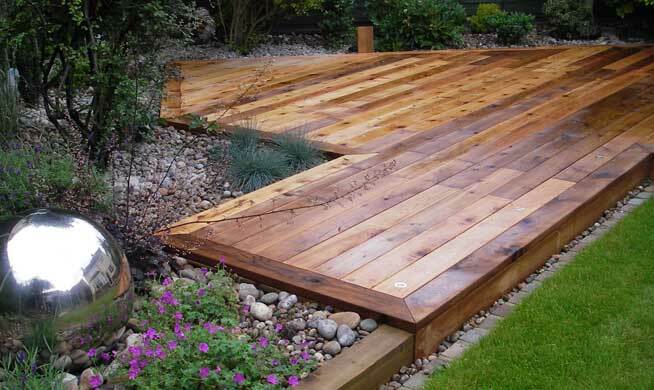 Your decking will look as good as new and, having been treated, last all the longer. And don’t forget that at the end of the summer a good clean – and perhaps the application of sealer – will help your decking weather the winter months and minimize damage. We always check for signs of rotting wood, and always advise immediate remedial work – to avoid accidents and to limit the extent of the damage and further, unnecessary expense. As handy with a saw as we are with secateurs, we’ll remove the rotten sections and skillfully replace with new wood – plus we’ll try and get to the bottom of why the decking has been damaged. It may be a leaky gutter and the constant onslaught of rainwater that has caused the rotting, in which case we’ll alert you to any additional work that may need to be carried out. Contact your local Diamond Garden Care team today to spruce up your decking. We’ll arrange a visit and a FREE no-obligation quote.